Time to brush up on your sporting prowess and take on the best of the rest. First up on this epic compilation, is the weird and wacky Pro-Skateboard simulator. Oil your Kryptonites and make sure your Gull Wings are functioning properly before taking to the track to beat the field on four wheels. There are plenty of options to pick from and some truly superb tracks, jumps, loops and bends to bring out the best of your RAD skills Moving from the rough and tumble of skateboarding, you'll need to be just as aggressive to take on the world in theexcellentlnternational Rugby offering. Take your pick from eight teams, including England. Ireland, Scotland, Russia and the Kiwis, and start practising your up and unders if you want to succeed. For some reason, Wales doesn't seem to be included in the initial line up of international teams, though after their showing in the latest championships, perhaps that is only fair. Take care to practice your moves, scrum down well and take the offence to your opponents to make sure you end up at the top of the League. Can you equal England's dramatic success of last year? That's entirely up to you. Moving on. Code Masters'epic 11-a-side soccer gets another airing, givingyou the chance to battle it out for the championship, taking in some crunching tackles and some fearsome opposition. However, if you prefer the gentler art of Tennis, then why not try out the excellent Pro-Tennis simulator, enabling you to take on some of the biggest names on the circuit today, on grass or clay, to bid for some of the most coveted titles in the world. Take care to master your strokes before you get going, otherwise you'll find yourself looking very sorry for yourself at the bottom of the ratings ladder. 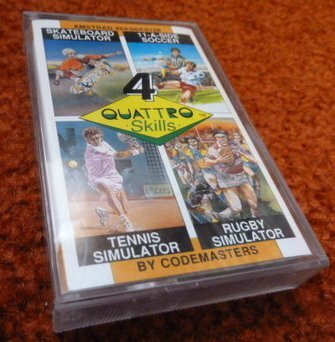 So there you have it, yet another brilliant collection of Code Masters classics, offering maximum playing power and featuring the usual Codies'style and graphics. If you liked the other Quattro offerings, then this is another must to adorn your collection shelf.